This page lists a selection of highly recommended research articles and books on qualitative research and data analysis. Achieving Rigor in Literature Reviews: Insights from Qualitative Data Analysis and Tool-Support by Bandara, Furtmueller, Gorbacheva, Miskin and Beekhuyzen - using software for systematic literature review. An International Systematic Mapping Review of Educational Approaches and Teaching Methods in Occupational Therapy by Hooper, King, Wood, Bilics, Gupta - A systematic mapping review identified topics, research designs, levels of impact and themes across educational scholarship. A framework for qualitative analysis of focus group data in information systems by Nili, Tate, Johnstone, & Gable 2014 - a useful guide to conducting focus group interviews. How many interviews are enough? by Guest, Bunce and Johnson 2006 in Field Methods - discusses saturation and the myth that there is a perfect number of interviews to conduct in a qualitative research project. Maximizing Transparency in a Doctoral Thesis1: The Complexities of Writing About the Use of QSR*NVIVO Within a Grounded Theory Study - by Bringer, Johnstone and Brackenridge (2004) Qualitative Research - discusses the importance of transparency in research. Current issues, problems, and trends to advance qualitative paradigmatic research methods for the future - by Leininger 1992 - discusses the misuse and pitfalls of qualitative methods - this paper argues that few researchers are prepared for qualitative analysis, or are aware of the range of approaches to inquiry. Facilitating the interaction between theory and data in qualitative research using CAQDAS by Sinkovics & Alfoldi 2012 - this is a usefully detailed article on using software to manage the entire qualitative research process. Developing a Codebook by DeCuir-Gunby, Marshall & McCulloch 2011 - This article is a must for all qualitative researchers, particularly useful for those working in teams. The NVivo Looking Glass: Seeing the Data Through the Analysis by Beekhuyzen, Nielsen & von Hellens 2010 - this discusses strategies for coding empirical data based on a doctoral study. Techniques for identifying themes in qualitative research by Ryan & Bernard 2003 - a really practical article providing ideas for coding qualitative data and identifying themes - a process often considered "mysterious". Beyond the Qualitative Interview: Data Preparation and Transcription by McLellan, MacQueen & Neidig 2003 - practical considerations to systematically organise and analyse textual data. Denzin, N.K. & Lincoln, Y.S. (eds) (2008) Collecting and interpreting qualitative materials. Thousand Oaks, Ca: Sage. - Includes a wide range of discussions on the art and practice of interpretation, including narrative, ethnography and text analysis. It starts from the premise that inquiry is not value free but occurs within a moral and political framework, and to “reengage the promise of qualitative research as a generative form of radical democratic practice” (p. ix). Gibbs, G. (2007) Analyzing qualitative data. London: Sage Publications. (This is avolume ofThe SAGE Qualitative Research Kit). - Focuses on the analysis of verbal data, the use of computer assisted qualitative data analysis and the role of writing. Saldana, J. (2009). The Coding manual for qualitative research. California: Sage Publications, Inc. - Brings together a wide range of ideas about data analysis. Organised into 29 different approaches to coding with examples and an extensive list of sources. Silverman, D. (2006). Interpreting qualitative data; methods for analysing talk, text, and interaction. London, United Kingdom: Sage Publications, Inc. (3rd ed.). London: Sage Publications, Inc. - Discusses approaches to analysing different types of qualitative data – interviews, texts, naturally occurring talk, etc. Provides examples of analysis and discusses issues of interpretation. 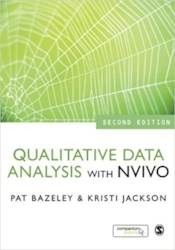 Bazeley, P. (2007) Qualitative data analysis with NVivo. (2nd ed) London: Sage Publications. - Organised in the sequence in which a project is undertaken. Applies to NVivo 7, so some features are out of date. Updated to NVivo 10 to be released in 2013. Bickman, L. (2008). The SAGE handbook of applied social research methods. (2nd ed.). California, United States of America: Sage Publications, Inc. - Included in the list as it has a useful section on integrating qualitative and quantitative approaches. Creswell, J.W. (2009). Research design: qualitative, quantitative and mixed methods approaches. (3rd ed.) California, United States of America: Sage Publications, Inc. - Little discussion of data analysis but includes a useful discussion of how to express purpose statements and research questions in qualitative, quantitative and mixed methods research projects. Creswell, J. W. (2007) Qualitative inquiry and research design; choosing among five approaches. Thousand Oaks, Ca: Sage Publications, Inc. - This text is useful for showing how approaches to data analysis align with approaches to qualitative inquiry. 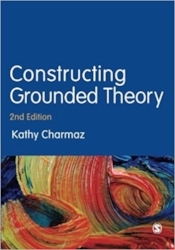 It focuses on narrative research, phenomenology, grounded theory, ethnography and case study. Denzin, N.K., & Lincoln, Y.S. (2005). The SAGE handbook of qualitative research. (3rd ed.). California, United States of America: Sage Publications, Inc. - Individual chapters illustrate approaches taken within different research traditions. This handbook focuses on American traditions in qualitative research, in contrast to the work by Flick (below) which includes European traditions. Flick, U. (2002). An Introduction to qualitative research. (2nd ed.). London, United Kingdom: Sage Publications, Inc. - This edition includes newer topics such as the use of internet surveys and the increasing attention paid to ethics in research. Flick, U., von Kardorff, E., & Steinke, I. (Eds). (2004). A Companion to qualitative research. London, United Kingdom: Sage Publications, Inc. - The section on analysis, interpretation and presentation includes chapters on hermeneutics and discourse analysis. Myers, M.D. (2009).Qualitative research in business & management. London: Sage Publications, Inc. - The section on data analysis compares the coding approach to data analysis with other approaches such as analytic induction. It provides an overview of approaches commonly used in business and management and then focuses on hermeneutics, semiotics and narrative analysis. Schwandt, T.A. (2007). The SAGE dictionary of qualitative enquiry. (3rd ed.). London: Sage Publications, Inc. - This volume expands on the 1997 edition. Rather than giving definitions, the 380 entries comment on the often contested meanings of qualitative concepts. The entries are listed alphabetically but a reader’s guide also groups them into broader topics such as Analyzing and Interpreting, Epistemology etc. Each entry also provides a list of key references. Seale, C., Gobo, G., Gubrium, J.F. & Silverman, D. (Eds.). (2004). Qualitative research practice. London: Sage Publications, Inc. - Data analysis is discussed by several authors in relation to different analytic frameworks (e.g. narrative research, feminist approaches and ethnomethodology). Silverman, D. (2005). Doing qualitative research: a practical handbook. (2nd ed.). London, United Kingdom: Sage Publications, Inc. - A comprehensive guide, with a short section of data analysis. In chapter 14 Clive Seale discusses using computers to analyse qualitative data. Silverman, D. (2007). A very short, fairly interesting and reasonably cheap book about qualitative research. 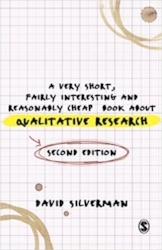 London: Sage Publications, Inc. - An easy to read, entertaining and sometimes challenging book which summarises Silverman’s ideas about what is important in qualitative research. Wolcott, H.F. (1990). Writing up qualitative research. Newbury Park, California: Sage Publications, Inc. - A practical guide written in simple language. Note: The discussion on analysis and interpretation is not very clear. Analysis is represented as “rigorous, agreed upon and carefully specified procedures” (p.30) for “observing, measuring ... what is “there” (p.29). Many qualitative researchers would dispute this view. Interpretation, on the other hand is represented as a sense-making activity which cannot be “proved” (p.30). Yin, R.K. (2011). Qualitative research from start to finish. New York,: The Guilford Press. - Includes a long section on getting started and emphasises choices in research design and methods. Rubin, H.J., & Rubin, I. (2005). Qualitative interviewing : the art of hearing data. (2nd ed.) San Diego United States of America: Sage Publications, Inc. - Discusses how to structure interviews, to follow up topics and links interviewing to the other stages of the research project.